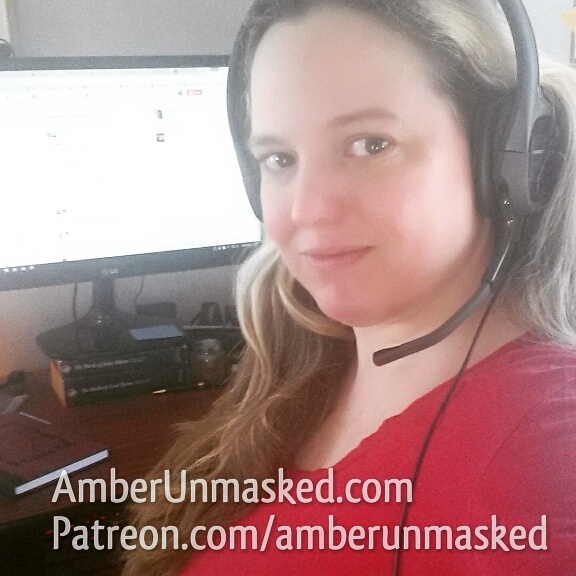 AMBER LOVE 31-MAR-2015 Step into my trusty time machine and let’s go back to 2013. 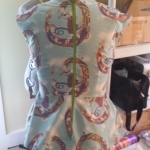 I had this wild idea to do another project runway thing at CGS Supershow using custom fabric designed by cartoonist Bill Ellis of ALL NEW ISSUES. As you can see from that post, things didn’t turn out quite as I had hoped, but nonetheless something was made. First, a Delirium of the Endless dress – no, not a cosplay outfit – a dress. 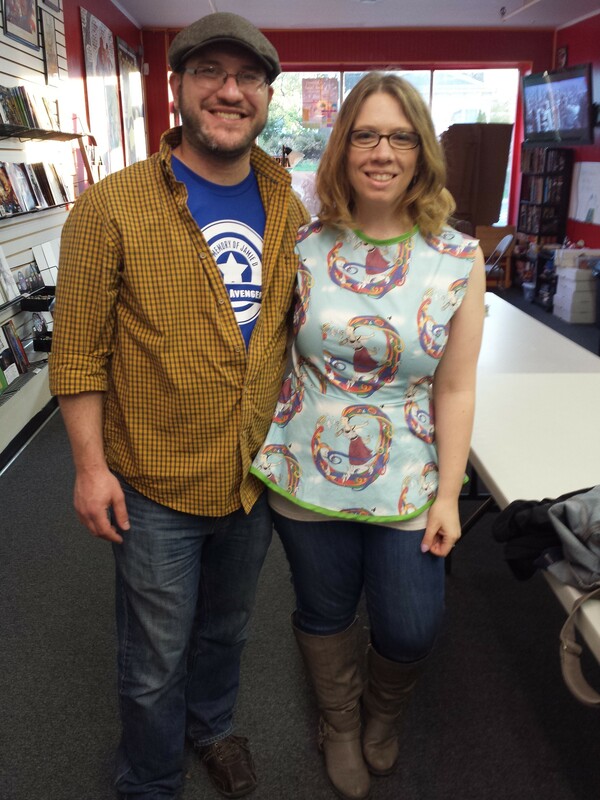 And finally today, I finished the blouse I had started in 2014 for writer Danielle O’Brien using the same custom fabric. 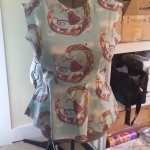 This isn’t really a tutorial because I used commercial patterns. If you can follow those instructions, go for it, you’re a better seamstress than I am. 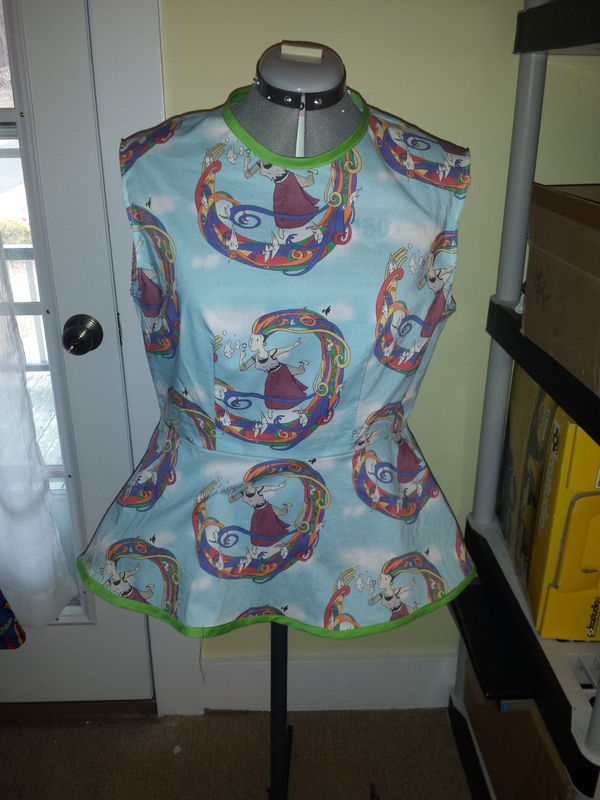 I’m embarrassed that it took me nearly two years from getting the fabric to finishing one blouse. 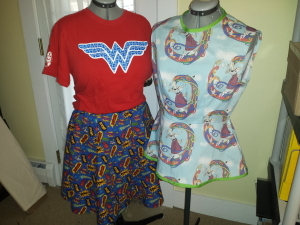 In that time, my sewing machine has broken twice and life has really not been all that kind to me. Plus, I don’t usually sew in the winters because I close off rooms that don’t absolutely need to be heated. Anyway, there ends my terrible list of excuses. 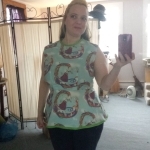 For Dani’s blouse, I used Vogue pattern 8815 on basic combed cotton from Spoonflower. Once again proving beyond a shadow of a doubt that something labeled “easy” is not. In fact, this pattern was labeled “very easy Vogue.” HAHAHAHAHAHAHA! 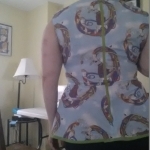 It’s far from being up to my standards, but I tested it out and it is wearable, providing it actually fits Dani. 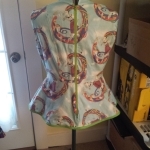 I started this as a surprise for her so I never asked for measurements. 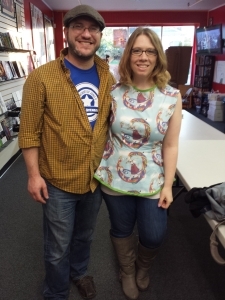 I was basically figuring, at the time, she was about the same size bust as me but a smaller waist. Now, I fully admit, I’m well beyond that from the past two years. I made some modifications because I couldn’t understand the directions (as always). Basically, I get to a certain point, get frustrated, cry, then decide to wing it when I have the strength. 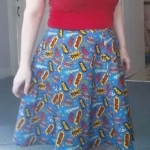 This weekend, I also made myself a skirt for Free Comic Book Day at Comic Fusion where I’ll be signing some comics on May 2nd. That was using a Butterick “easy” pattern B6044 which I scored from the Joann’s sale rack for about $3. It also had some awkward instructions that I couldn’t quite figure out so I did the best I could. 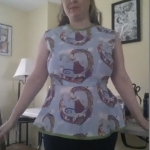 I needed a pattern not only marked “easy” but also in plus sizes which is damn near impossible to find. 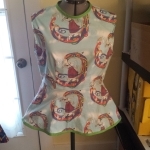 I’ve searched online before getting to the store to see what my chances are and the pattern makers are woefully lacking in the variety of plus sizes. 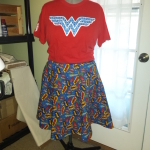 Sure, if you want some ill fitting ugly outfit that’s basically scrubs or pajamas, but try finding a decent skirt. 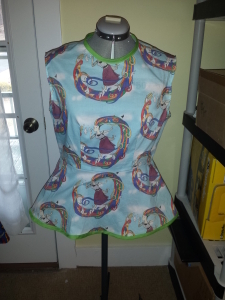 The fabric I used was also from Joann’s in the novelty cotton section. It’s quite thick and stiff – I didn’t both prewashing as I normally would. 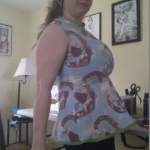 And using the size 18 marks, it barely fits me so I don’t want to shrink it before I get any chance to wear it. If I can get a few uses and then wash it, fine. As it was, I didn’t actually have the right amount of fabric because I bought two yards of it before I knew what I was going to do with it. 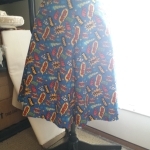 The pattern at that size calls for over two yards. 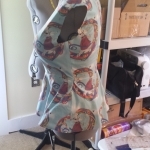 There’s another fabric I designed using quotes from Gaiman’s SANDMAN before he started to really tick me off about trigger warnings and mocking them. 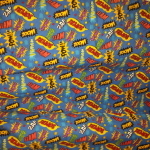 It’s a deep purple fabric with white lettering and also available on Spoonflower. I’ve never made anything from the quote fabric, but I got a couple swatches and recommend the performance knit.